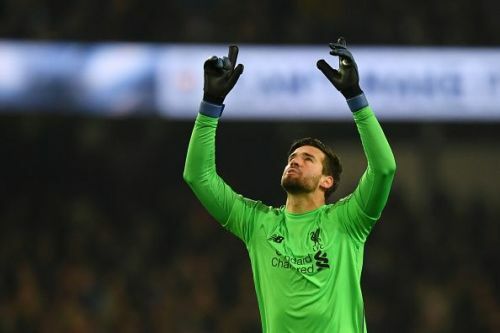 Liverpool goalkeeper, Alisson Becker believes that his team is still confident of winning the league despite failing to win in the last two games. Jurgen Klopp transformed Liverpool from strugglers to one of the best teams in Europe in little more than three years and the Reds are currently second on the Premier League table. They are among the favourites to win the Premier League title this season and could be crowned as the Champions of England for the first team since 1990. However, they failed to register a win in their last two league games against Leicester City and West Ham United respectively, which increased the pressure on the team. Speaking to Sky Sports, Alisson said that his team still believes that they can win the Premier League this season. "Our pressure is the same,". "We take things game by game without worrying about what our opponents are doing. "Everyone wants to win this league but at Liverpool, our concern is winning games and not dropping points. "I really want to win the Premier League with Liverpool". "To get back to the top of the league we need to win games that comes from hard work, starting on Saturday." Liverpool will play Bournemouth next in the league, and the Reds will be looking forward to getting back to winning ways and restore their position at the top of the Premier League table.